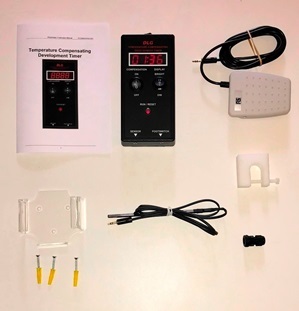 The Temperature-Compensating Development Timer is designed to be extremely simple and intuitive to use. It is simply a digital stopclock, which runs at a rate dictated by the temperature of the developer solution. Wide operating temperature range from zero to 54 deg. C.
Implemented temperature co-efficient 2.5 (equivalent to using Ilford tables). Can be supplied with alternative coefficients implemented at a small charge. All the below accessories are included with your timer. All are also available seperately - see spares and accessories. Temperature Sensor Probe - a precision stainless-steel thermistor with 1m connecting cable terminated in a 3.5mm jack connector. Cable can be extended using a male-to-female 3.5mm stereo (three-pole) jack lead. Foot Switch for compensating developing timer. Switch duplicates the function of the "run-reset" button on the timer and allows hands-free operation. Fitted with 2m connecting cable terminated in a 3.5mm jack connector. Cable can be extended using a male-to-female 3.5mm stereo (three-pole) jack lead. Wall Cradle for the Compensating Developing Timer. Includes wall fixings. Allows drop-in, lift-out of the timer. Sealing Gland - allows temperature sensor to be sealed into a tank cover, permitting inversion agitation with the sensor fitted. Requires half inch / 12mm hole. Instruction Booklet - 10 pages, also downloadable here. 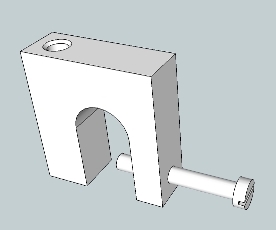 Tray Clamp - holds sensor to tray for tray developing. Acetal plastic with nylon screw. Clamp secures to tray with clamp screw, sensor drops in through hole in clamp. All supplied in a quality foam-line presentation box. Please Contact Us if you have any queries or need any further information. We stock a full set of replacement parts - please visit our spares and accessories page. Time-Temperature Charts - a selection of time-temperature charts at different temperature coefficients, and guidance on developer temperature coefficients. 36 pages, including 25 time-temperature charts for different temperature coefficients. pdf file, 730KB. Free Download.